Any contemporary anime viewer has, to some extent, been exposed to moe in one form or the other. Moe can be broadly defined as the feeling of affection towards fictional characters. The word can also be used to describe specific design elements that make a fictional character the object of such affection (for example: cat ears can be considered moe). But how did moe came to be, and why did it catch on fire and became so popular in the first half of the aughts? Patrick W. Galbraith’s book The Moe Manifesto is a semi-academic attempt at answering these questions. The book is a collection of interviews conducted by Galbraith. 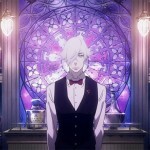 In his attempt to better understand the nature of moe and its target audience Galbraith interviewed studio directors, manga and anime critics, artists and even a psychiatrist. The result is an interesting mix of opinions about the otaku culture topped with many eye-opening cultural facts. 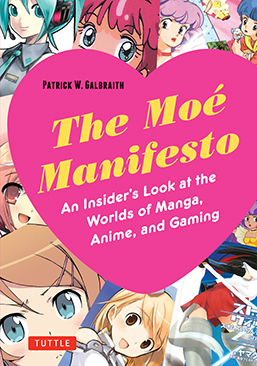 Despite its name, The Moe Manifesto is first and foremost a study of the otaku subculture and how it evolved to incorporate moe elements. The book does a fantastic job at explaining why otaku exist and how their essence has changed over the years. It also touches on several key Japanese cultural notions, such as why school is such an important backdrop for anime and how come adult males in Japan relate to cartoon feminin heroines. Interestingly the book doesn’t reach a definite conclusion as to what moe really is. It is rather a fragmented manifesto, one that contains an amalgamation of views on the subject taken from several perspectives. The Moe Manifesto is at its best when Galbraith interviews producers and critics. The former provide us with a rare insight into the creation and marketing process of anime series, while the latter dissect the components that make the final products so endearing to the moe-loving crowd. The book’s weakest interviews are arguably those conducted with artists. They tend to be a summary of the artist’s career and current work, and contribute very little to defining moe. Although Galbraith cherry-picked key artists and voice actors for this book they all inadvertently end up saying they don’t consider their creations as moe. This might be a result of a cultural barrier Galbraith was unable to surpass (artists which are too humble to take credit for their creative endeavors while speaking with an outsider). Another gripe I have with this book is its excessive use of images. The pages are filled to the brim with manga, anime, figures and game images. Some pages have a ratio of two images per one text paragraph. Since most of the interviews in this book are insightful and informative it’s a pity they are not spread across a greater number of pages and are surrounded by unyielding amounts of images. The book offers a wide variety of opinions on the notion of moe. Some view moe as a visual fad while others think of it as a successful marketing strategy. A couple even consider it the result of a socially malfunctioning postmodern Japan. Galbraith has notably decided to provide us with a positive outlook on moe, so don’t expect any moe-bashing or references to the negative effects moe had on the anime industry. That said there are two specific interviews (with Honda Toru and Azuma Hiroki) that tackle the obsessive and socially-harming aspects of the otaku mentality. The origins of moe in manga are also discussed at length throughout the book and many references to dojinshi (manga produced by amateurs, or without the backup of a relevant manga company) are made. This is a great addition since dojinshi are rarely referenced in Western manga literature. Unfortunately Galbraith repeatedly (and erroneously) refers to dojinshi as “fanzines”, which shows he is not familiar with that specific subject matter. While The Moe Manifesto is not as robust or as definitive as I would have liked it to be it still is an entertaining read. Since it is comprised almost entirely of interviews it’s a great resource for people in the academia wishing to conduct research on the otaku demography. But even if you aren’t out looking for research materials, but are generally interested in the creative process behind the making of anime and manga, The Moe Manifesto might teach you a thing or two. You can buy The Moe Manifesto on amazon or via Tuttle Publishing’s website.